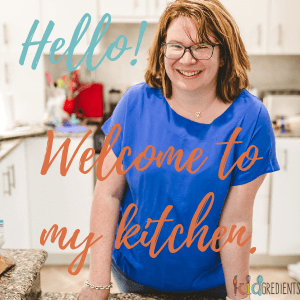 You are here: Home / Recipes / Dinner / Crunchy, herby salmon panko bites – baked not fried! 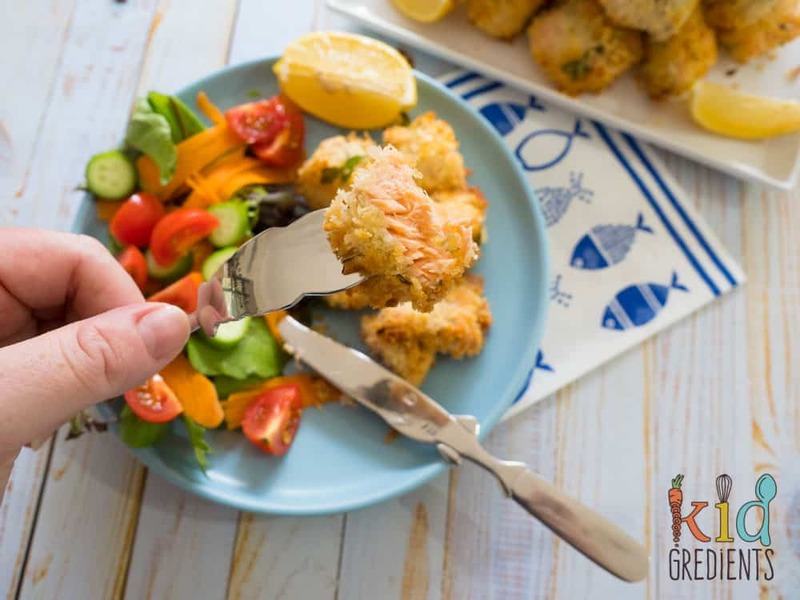 This crunchy, herby salmon panko bites recipe is brought to you in collaboration with Tassal Salmon, as always all the opinions are mine. So you need an awesome midweek meal? One that is filled with goodness, kidfriendly, easy to make, delicious and super quick to make? Then look no further! 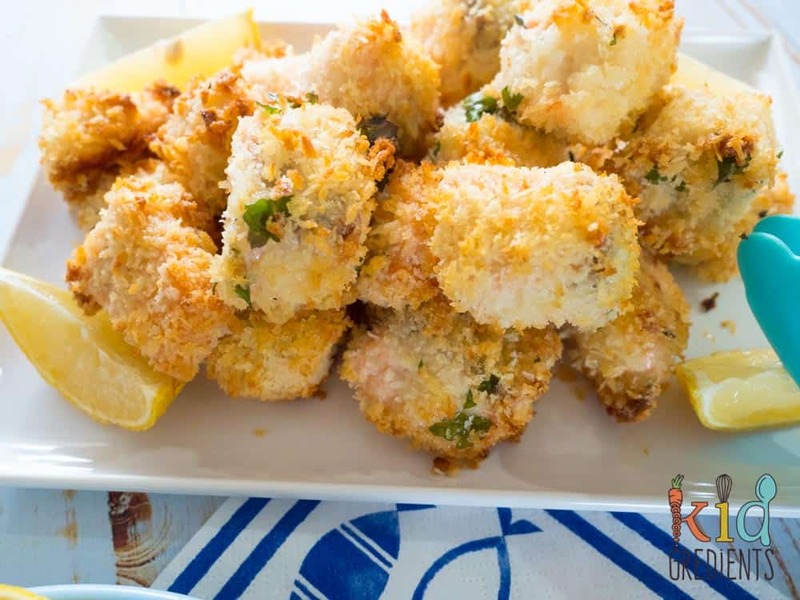 These crunchy, herby salmon panko bites are the bomb! Ready in only 20 minutes and with all the yum you need, these salmon panko bites are the most fantastic dinner you can make mid week. Seriously, what is not to like about bite sized salmon pieces? They lasted all of about 30 seconds when I popped them on the plates for my kids! Salmon is packed with Omega 3 oils. But that’s not where it ends, 100 grams of salmon contains 42% of your daily protein requirements. Salmon also contains other essential nutrients: vitamin D, vitamin B6, vitamin B12, phosphorous, magnesium, potassium and selenium. 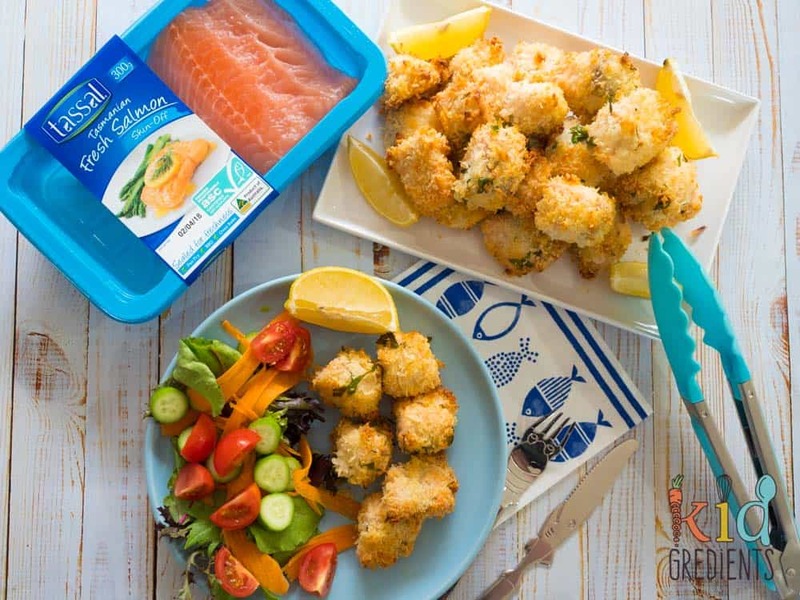 There’s no need to go to the fish shop to get it either- these prepackaged packs of Tassal Salmon are available at Woolworths and they are super fresh! 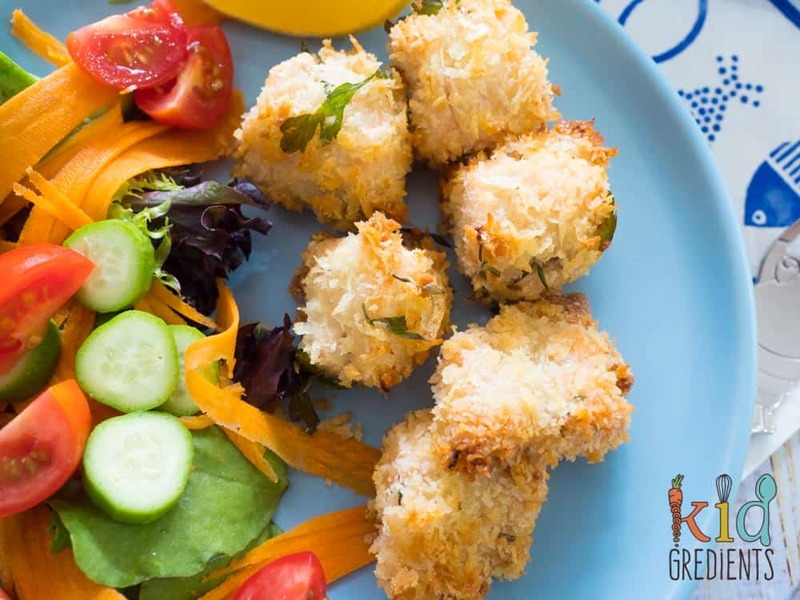 Pair these crunchy, herby salmon panko bites with a salad, or some sweet potato fries and you’ve got an amazingly nutrient packed meal that the kids will love! 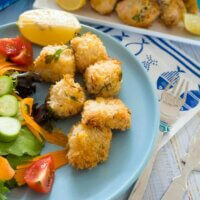 These bites tick all the boxes for kids as they are small, crunchy and the mayonnaise makes sure the fish stays moist. We are loving creating all these recipes with Tassal Salmon! Have you seen the smoked salmon sandwich sushi we created? It’s such a hit for the lunchbox. how’s that for a healthy dinner? If your kids love fish and chips, then this will be a winner and is much quicker and easier to make than battered, fried fish and chips. 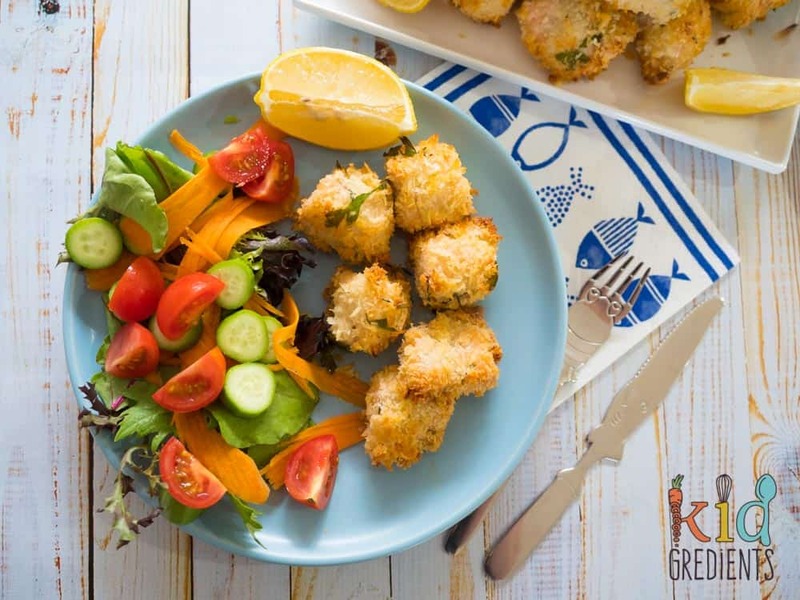 By doing the crumbing with mayo instead of egg and flour, these crunchy, herby salmon panko bites are a super quick way to get dinner on the table and gobbled up! look how yummy they are! 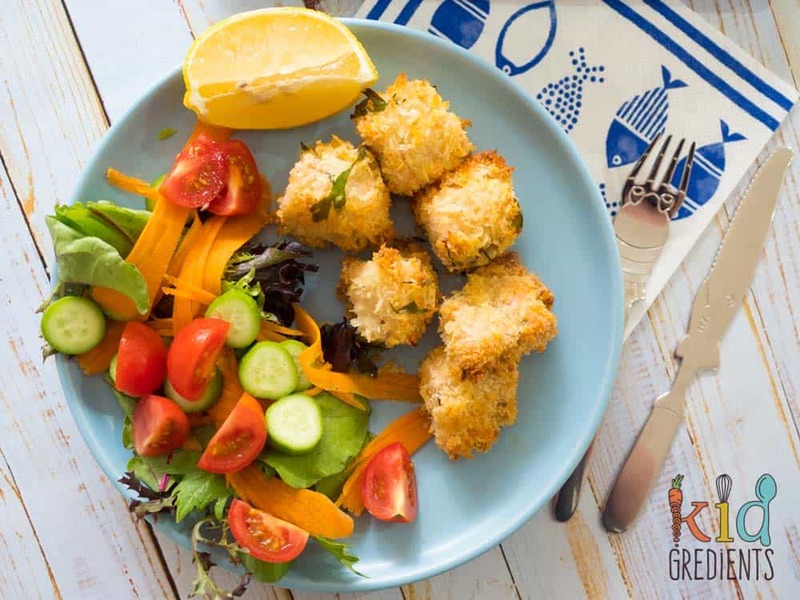 These crunchy, herby salmon panko bites are the perfect midweek meal! Quick and easy to make and super kidfriendly. Chop the salmon pieces into bite sized chunks. Coat the salmon pieces in mayonnaise. Combine the herbs and panko crumbs together in a large bowl. Dip each salmon piece into the panko mixture and roll into it to coat well. Spray lightly with olive oil and bake for 15 minutes at 190 degrees. Serve with salad, veggies or roast potatoes.